Almost one in five secondary schools in England have been given a "no excuses" warning to improve their GCSE exam results or face closure. Schools Secretary Ed Balls has launched a £400m drive to raise results in the lowest-performing 638 schools. An extra 70 academies, costing £195m, will spearhead this reform, so that almost one in 10 secondary schools will have academy status by September 2010. 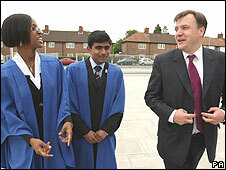 Academies could "break the link between poverty and attainment", said Mr Balls. The National Challenge, launched by England's education ministers on Tuesday, requires every secondary school to have achieved the benchmark of 30% of pupils achieving five good GCSEs including English and maths within three years. There are 27 secondary schools in Birmingham, 33 in Kent and 13 in Manchester facing this exams ultimatum. The highest proportion of schools needing to improve is in Bristol - where almost two out of three schools are below the required threshold. Local authorities have been ordered to come up with detailed plans to improve these schools - but Mr Balls made it clear that local education authorities as well as individual schools could be taken over and replaced if they failed to deliver. "I don't want to see excuses about poor performance - I want to see clear plans to raise standards," said Mr Balls. This will mean the acceleration of the academy programme, with 313 of these independent state schools set to be running in the next two years. Lord Adonis, who has promoted the expansion of academies in London, said they "clearly work", in terms of raising achievement more rapidly and appealing to parents. "Academies in the last few years have been taking intakes from more deprived areas and have faster rises in results than the average," Mr Balls told BBC Radio 4's Today programme. The National Challenge will offer struggling schools extra funding, expert advice, mentoring from experienced head teachers and assistance from neighbouring schools and external partners. The former chief inspector of schools, Mike Tomlinson, will chair a panel of National Challenge expert advisers. There will also be a new type of school structure for those "completely unable to raise their exam results". These National Challenge Trusts will see the shutting down of the failing school and a reopening of a new school, to be run as a joint project with a high-performing local school and a partner such as a local business or university, with up to £750,000 funding. It is expected that there will be up to 70 of these National Challenge Trusts. Grammar schools could be partners to secondary modern schools in areas where a selective system operates. The National Union of Teachers has rejected the government's threat of closing these 638 schools - and says that these schools are often performing well in the "toughest areas". But the government says there is no simple link between deprivation and underachievement - and that 96 of these schools have an intake that has a below average proportion of pupils on free school meals. In 10 local authorities there will be a £200,000 initiative aimed at deprived areas, to be called Extra Mile, which will fund partnerships between struggling schools with successful neighbouring schools. This project is aimed at getting pupils from deprived areas to raise their ambitions, with mentoring, visits from "local heroes", a system of houses and prefects and cultural trips. Although welcoming the extra support for schools working in the "most challenging communities in the country", head teachers' leader John Dunford has warned against "stigmatising" this group of schools. "It is entirely wrong for these 638 schools to be described in the media as failing. As the government has acknowledged, many of them are on a rising tide of achievement under their existing leadership," said Dr Dunford. The Shadow Schools Secretary, Michael Gove, said that the latest initiative showed the government did not know how to tackle weaknesses in schools. "It is not just 600 schools at the bottom which give cause for concern. There are hundreds more where fewer than half the children get five good GCSEs and as a nation we are falling behind," he said. 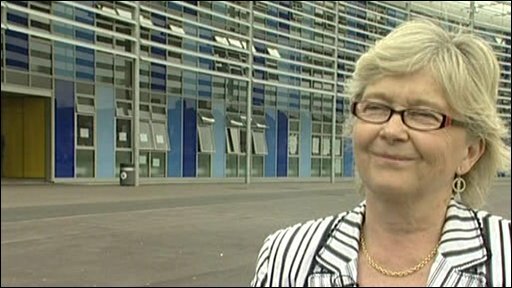 The NASUWT teachers' union rejected the "focus on failure and closure". "The schools identified as part of the National Challenge are not failing schools. They have simply not yet met, for a variety of reasons, a series of arbitrary numerical targets in certain subjects but with more support will continue on their way to doing so," said the union's general secretary, Chris Keates. The NUT's acting general secretary, Christine Blower, also challenged the plans for more academies and trust schools. "Academies and trust school status are not the solution. If local authorities, according to Ed Balls are key to providing support, then what sense does it make to separate them from the local authority family of schools?" she said. The plans relate to England, as education is a devolved matter. The concept of setting such targets does not exist in Scotland or in Wales, where there are also no school "league tables". Similarly the proposed solutions - in the form of academies and trusts - exist only in England. A consultation has just been held in Northern Ireland on a proposal by education ministers there to make its improvement programme more focused on self-evaluation by individual schools.